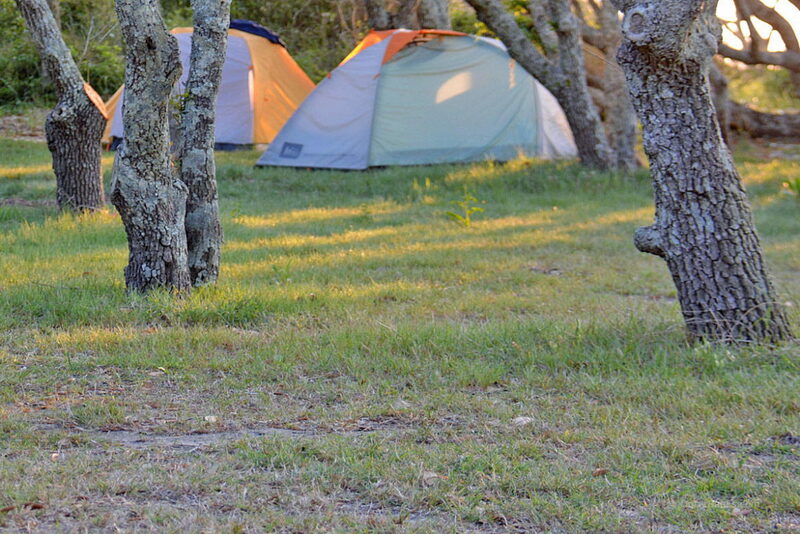 From the rustic barrier islands that are located offshore, to the mainland parks that resemble full scale resorts, there’s no shortage of options when it comes to camping in the Morehead City region. Best of all, because this coastal town is wonderfully close to local beaches, National Forests or National Refuges, hopping coastal towns, and everything in between, it’s easy to craft the camping adventure of a lifetime with a trip to this central Crystal Coast region. So enjoy a rustic adventure with the ocean as a backdrop, or enjoy a full week of fun where every amenity is accounted for – In Morehead City, every camping trip can truly be as adventurous, or as luxurious, as a visitor desires. There are a wide range of campgrounds that are within minutes of Morehead City, and which can range from cool wooded destinations to sunny oceanside escapes. Regardless of whether a traveler craves natural scenery or a fun and all-inclusive environment, the Morehead City and Crystal Coast region truly has it all. Oyster Point Campground is one of the closest campgrounds to Morehead City, and features a fine location that’s on the edge of the Croatan National Forest, and just 10 minutes or so away from the heart of the bustling downtown Morehead City region. Visitors on the hunt for a natural expedition will find campsites next to the trailhead of the famed 21-mile long Neusiok Trail, and the limited number of sites – as well as the wooded environment – creates a peaceful and relaxed atmosphere. Amenities at the sites for RVs and tent campers include the basics, such as a fire grill, a picnic table, a tent pad, and a lantern post. The campground features vault toilets and drinking water for added convenience, and the sites are generally offered at a first come, first serve basis. The Cedar Creek Campground and Marina will attract travelers of all varieties, thanks to an extensive complex that includes a boat ramp and 32’ ft. long fishing pier, a bath house with hot showers, a dump station, and a locale that’s close to local grocery stores, gas stations, and a number of attractions in the northern region of Cedar Island. RV and tent campers are both welcome, and visitors will enjoy a lovely view of Salt Water Creek, as well as convenient locale that’s roughly 25 minutes away from Beaufort and Morehead City attractions. Long term vacationers who want to enjoy a quieter slice of the Crystal Coast will appreciate The Landing RV Park. This site which is found just a 25 mile drive or so away from Beaufort and Morehead City features free wireless internet, 30 or 50 amp electricity, sewer and water hook-ups at individual sites, and complimentary landscaping services for the local RV community. Amenities at the complex itself include a community boat dock on the edge of the Core Sound, laundry facilities, shaded picnic areas, and amazing water views. The site is close to a selection of local shops and eateries, and is also close to several ferries that access the Cape Lookout National Seashore. The town of Newport, which is located just 15-20 minutes away from Morehead City, is home to the Goose Creek Resort RV and Camping Resort, which is an enticing combination of a wooded landscape on the edge of the Croatan National Forest, and a host of amenities designed to keep guests entertained. The resort boasts a seasonal swimming pool with waterslide, a game room, an outdoor playground, and a full roster of summer events courtesy of their seasonal programs. In addition, RVs will enjoy full hook-up sites complete with water, and 30 / 50 amp electric service. With easy access to Morehead City – as well as the Bogue Sound – this is a fine destination to see everything the barely-inland portions of the Crystal Coast has to offer. The Whispering Pines Campground is located in the town of Newport, which is roughly 15 miles west of Beaufort, and which has an enticing location that’s on the edge of the Bogue Sound. This extensive resort features 190 RV sites which feature full hook-ups with 30 amp power or more, free high speed internet access, and cable TV. In addition, the complex has a wide range of community amenities which includes a clubhouse / recreation room with pool table, a playground, a dog park, a seasonally operational swimming pool, a bathhouse with showers, laundry facilities, and even a fishing pier and on-site boat ramp that connects with the Bogue Sound. Extensively entertaining inside and out, both temporary and long-term visitors can be accommodated at this gracious and fun resort. This Newport RV Park, which is within 15 miles of Morehead City and Crystal Coast attractions, boasts 77 RV sites which feature full hook-up capabilities, as well as an additional 11 sites with just electricity and water available. Perched on the edge of the Bogue Sound, the extensive community amenities include fishing and boating access, a bathhouse with hot showers, a playground, a barbecue and picnic area with grills, and beautiful views on the edge of the water. Short term and long term RV guests are both welcome, and pets are allowed at the park as well. Paul's RV Park and Boat Ramp is located in the inland town of Havelock, and features just a handful of RV sites that will entice mariners and visitors who appreciate a quieter locale. Situated in between the Croatan National Forest and the Neuse River, this campground features pull through sites with 30 and 50 amp electricity, as well as water and sewer, and welcomes both short and long term visitors – which includes pets. Visitors who stay in this quiet locale will be close to a number of popular Crystal Coast destinations, which includes Morehead City, as well as New Bern and Beaufort. This family friendly campground that’s located in the town of Havelock is roughly a 20 minute drive away from Morehead City and the Crystal Coast attractions, and as such, has a nice array of nearby amenities that’s coupled with a quiet atmosphere. The campground features roughly 35 sites, which includes 15 or so full hook-up sites with 30 or 50 amp power. Pets are allowed, and the campground boasts shaded sites, showers, and a dumping station as well as on-site grounds that are perfect for fishing, a game of horseshoes, or just playing catch. Situated on the edge of Long Creek off the Neuse River, visitors can enjoy a water view in a quiet and primarily residential location. Visitors who want to be close to the beaches of the Crystal Coast as well as the historic town of New Bern can set their sights on the Neuse River Recreation Area, or the Flanners Beach Campground. This complex features a three-mile nature trail, ample kayaking and fishing along the riverfront, a bath house with hot showers, a dump station, and an array of other extras. Electric hook-ups are available for RVs, and the community amenities, which includes fire rings with grills, picnic areas, multiple playing fields, and a natural shoreline, will make enjoying the great outdoors a dream. The Flanners Beach Campground is located on the edge of the Neuse River, close to the town of New Bern. Morehead City visitors are remarkably close to a number of fantastic beaches within and around the Crystal Coast, which includes the Cape Lookout National Seashore. This 56-mile long undeveloped barrier island shoreline stretches from the northern edge of Cedar Island all the way to the outlying borders of Beaufort, and includes incredible and natural shorelines that are perfect for fishing, shelling, and enjoying miles of peace and quiet. Morehead City visitors will be roughly a 15-60 minute drive away from local ferries that can provide passenger or vehicular transport to this string of barrier islands, and once on shore, visitors can enjoy rustic camping at its best. Though the Cape Lookout National Seashore is home to two campgrounds that are managed by the National Park Service (NPS), campers can also set up a 4WD camper truck or tent on veritably any region of shoreline to enjoy their own rustic paradise by the sea. While the setting is undeniably beautiful, there are a few NPS rules and regulations, as well as environmental considerations, which visitors will want to keep in mind before landing on the Cape Lookout National Seashore for an unparalleled camping adventure. There are three components of the Cape Lookout National Seashore – the North Core Banks, the South Core Banks, and the Shackleford Banks. (Morehead City visitors are closest to the Shackleford Banks and the South Core Banks.) While all three regions can be accessed by ferry, without a private vessel, visitors will be unable to “hop” from one island to the next. The only way to access the Cape Lookout National Seashore is by a privately owned vessel or a local ferry. Passenger ferries depart for the Shackleford Banks and South Core Banks from the neighboring towns of Beaufort and Harkers Island, and 4WD vehicular ferries depart from the Cedar Island towns of Atlantic and Davis. Advanced reservations are recommended and may be required, (especially for vehicular ferries), to catch a ride to the National Seashore. There are also several inshore charter boat businesses in Morehead City that can transport visitors to the Cape Lookout National Seashore. Call ahead or browse online for custom trip options. There are two campgrounds within the 56-mile long Cape Lookout National Seashore, which comprise of small cabins or duplexes, and which are located on the North Core and South Core Banks. Advanced reservations are required for either of these campgrounds. Visitors should note that with the exception of the visitors’ centers that are close to Harkers Island, Cape Lookout, and Portsmouth Island, there are very limited facilities available once on the National Seashore. As a result, campers will want to bring along all the supplies they need – including water and food – for the duration of their stay. Trash cans and dump stations are also limited and / or non-existent as well. Bring along plenty of trash bags, and take out everything you bring in. Visitors can camp anywhere along the National Seashore, provided they are at least 100’ ft. away from manmade structures including wells, boat docks, and historic landmarks – (this includes Portsmouth Village in Portsmouth Island, and the Cape Lookout Village/a> and Lighthouse in the South Core Banks.) In addition, campers cannot stay in the ocean-facing dunes as a measure to protect the fragile vegetation. It is completely free to camp in the National Seashore, (with the exception of the NPS managed campgrounds), for up to 14 days. Large parties of 25 people or more will need to acquire a Special Use Permit from the National Park Service before their stay. There are no paved roads within the Cape Lookout National Seashore, and as such, only 4WD vehicles are allowed, such as trucks, pick-ups, or ATVs. Campfires are allowed throughout the seashore, provided that they are made below the high tide line on the ocean-facing shoreline. Contained fires, (such as grills), are allowed throughout the seashore. Pets are also welcome throughout the National Seashore, provided they are leashed at all times. There are two campgrounds on the National Seashore which, in addition to the 50+ miles of natural terrain that is seasonally open to campers, can be reserved for a slightly less rustic stay. The Long Point Cabins are located on the southern edge of Portsmouth Island, and are accessible via a ferry that departs from the town of Atlantic on Cedar Island. This oceanside camping complex features 20 duplex-style units which each feature six bunk beds, a kitchen with propane oven and stove, a “dining area” with table and chairs, a bathroom with a hot shower, and a propane grill and shared screened porch. Electricity is provided in these cabins, and the units include a hot water heater. Regardless of where a visitor lands, campers should note that they will want to pack along a number of items when staying at either campground, which includes linens and bedsheets, towels, cookware and plates, and / or coolers or other portable refrigeration devices. Both campgrounds are seasonably open from March through Thanksgiving, and are extremely popular. As such, reservations for either campground should be made well in advance through the National Park Service’s website at https://www.nps.gov/calo/planyourvisit/camping.htm to secure a spot. It is traditionally warm enough in Morehead City and the surrounding Crystal Coast region to camp throughout the year, with summer temps in the high 70-80 degree range, and winter temps in the 40-50 degree range, in average. Even so, the area is known to experience an occasional cold snap, so portable heating devices may come in handy for wintertime visitors – especially those staying in tent sites. In addition, campers will want to check the weather before arriving to ensure there are no nor’easters, tropical storms, or hurricanes on the horizon. Although the Morehead City area has traditionally been spared from coastal hurricanes, wind speeds can easily increase during a storm to 20 mph or more, which can cause damage to a tent or any outside gear. Just use caution, and make travel plans accordingly, to ensure a hurricane or other variety of storm doesn’t put a damper on an otherwise sunny vacation. Finally, Morehead City visitors should also check seasonal availability for campgrounds or campsites, especially in areas that are managed by the Croatan National Forest or the Cape Lookout National Seashore. Some areas may be only open for the warm weather months, (aka, March through October / November), so it’s essential to check ahead when planning a winter getaway. A number of campgrounds – and especially the Cape Lookout National Seashore – can fill up weeks or even months in advance, especially for popular travel times like 4th of July or Labor Day holiday weekends. Book as far in advance as possible to secure a spot. Don’t forget the essentials for being in the Crystal Coast great outdoors, which includes bug spray – especially in the summer months – and sturdy shoes / long pants for hiking and exploring the area’s nature trails. Additional campgrounds are also available in the western Crystal Coast beach town of Emerald Isle, which is located about a 20-30 minute drive away from Morehead City, depending on the traffic. These sites are close to the beach, and offer a nice helping of all the fun amenities the Crystal Coast shoreline is known for – which includes area restaurants, shopping, and plenty of shoreline to go around. Make sure that you reserve ferry reservations in conjunction with your National Park Service accommodations when booking a cabin or cottage on the Cape Lookout National Seashore. Unless you are accessing the shoreline via a private vessel, you’ll need transportation to reach this desolate chain of barrier islands. Need supplies? Morehead City is a perfect destination for everything a camper requires, thanks to its status as home to the Crystal Coast’s largest collection of grocery stores, shopping centers, sporting goods stores, and everything in between. Reserve a little time to explore the local shops, and fuel up on everything you’ll require for a great camping trip. Morehead City is close to a host of exceptional camping destinations that can range from the purely rustic, to the downright luxurious. Whether an RV traveler just needs a convenient home base, or a true adventurer wants to live by the beach for a spell, chances are that whatever your camping expedition entails, you can find it in the Morehead City and Crystal Coast region.